I think I’ve found my favorite chocolate cookie recipe. “These have to be your ultimate cookies to satisfy guests” was my husband’s first sentence when he had a bite. I agree. I can honestly describe these Mexican Hot Chocolate Cookies as a real Show-stopper! This is a recipe you need to know to impress someone. 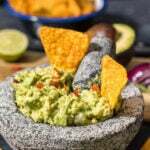 If you are making plans for Cinco de Mayo next week, you might have already made your mind about the appetizers (Hello Chili Pepper Guacamole, one of my favorite dips!) and the drinks. What about dessert? You can’t feel ready to the party without a good dessert, right? These Mexican Hot Chocolate Cookies are here to help you on this. They are spicy with a hint of cinnamon and cayenne pepper, super fudgy and so inevitably addictive! I adapted this recipe from a brownie cookie recipe I saw on Pinterest. I spiced it up a bit and ended up with the most amazing chocolate cookie recipe. It’s like you’re eating a brownie in a cookie form and with a spicy kick. 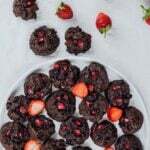 If you have never tried even a spicy chocolate before, you might feel suspicious about these spicy chocolate cookies. You might find it crazy to have the sweet and hot flavors together. I can truly understand but trust me on this. The heat is not overwhelming. You feel it at the end, right after you swallow. If you have kids though, it might be better to divide the batter into two and add the cayenne pepper in one of them. The other spice in these cookies is cinnamon and it’s here to balance the flavors. Plus, your house smells like heaven. If you are not a fan of it, you can leave it out though. Is there anyone on this earth not loving cinnamon? I think these cookies make a wonderful Cinco de Mayo dessert and they will spice up your party for sure. 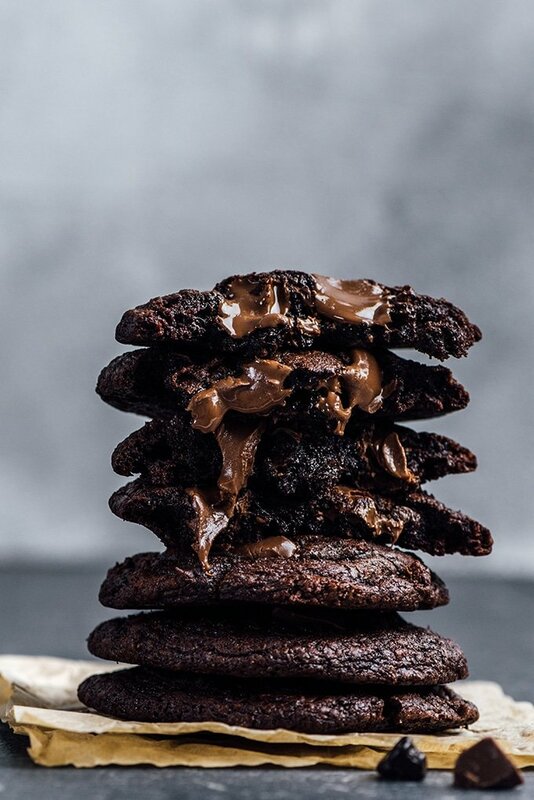 Rich, fudgy, spicy and super chocolatey cookies that are always a winner. Melt butter and 12 ounces bittersweet chocolate chips in a medium bowl over a small pan of simmering water. Stir until smooth and remove it from the heat. Set aside to cool. In a large bowl, beat the eggs, sugar and vanilla extract using an electric mixer until the batter is thick and creamy. Reduce the speed and add in the melted chocolate and butter mixture. Beat until combined about 30 seconds. In a separate medium sized bowl, whisk together the baking powder, cinnamon, cayenne pepper, salt, all-purpose flour and cocoa powder. Gradually add this into the wet mixture and stir with a spatula just until combined. Fold in ½ cup semisweet chocolate chunks and bittersweet chocolate chips mixture. Cover the batter and chill for 30 minutes. Using an ice cream scoop, drop batter onto the prepared sheets about 2 inches apart. Bake 8-10 minutes (I baked for 8 min). The cookies will look set at the edges but still be a little wet in the center. Don’t over bake! Let them sit in the baking sheets for about 5 minutes and then transfer on a cooling wire rack. Meanwhile top each with semisweet chocolate chunks or chips. Prep time doesn’t include 30 min. chilling time. I LOVE these cookies. The first time I made them I forgot that I was out of cinnamon. I’ve since made them with the cinnamon but I think I prefer them without. I found this recipe about a month ago and I’ve made at least 8 batches already. My store doesn’t sell bittersweet chocolate anymore so I have to use dark chocolate and they still turn out great. I reduced the cayenne and arranged the chocolate on top to look like bear paws with almond slivers for claws for a kids party and they were a hit. If they’re just for me I increase the cayenne slightly. I also sprinkle the tops with a tiny bit of flaky salt to get the salty/sweet/heat combo. I scoop them by about a rounded tablespoon and get about 40 cookies that are perfectly cooked at the 8 minute mark. Thank you for sharing this recipe! Hi Jennifer! I’m so happy to hear that you loved the recipe! I have a weakness against cinnamon, so I can use it in any recipe. Giving the shape of bear paws on the top of cookies is a brilliant idea! Thanks for sharing your feedback with us here! By far one of the best cookies I’ve ever had! The texture is amazing! Went great with vanilla bean ice cream! These are the best chocolate cookies I’ve ever had. I will forever use this chocolate base in all my recipes. I tried adding a few marshmallows to the top of them and they got all toasty and yummlicious. Could you do this with a box of chocolate cookie mix? Or chocolate brownie mix? And just add the spices? Hi Katie! Never used cookie mix or brownie for this recipe, but I guess they work. Have you ever tried to adapt this for a cake? I’m trying to figure out how😶 I think the spices incorporated into a buttercream on a chocolate cake would be awesome! What size ice cream scoop was used? There is no specific size for it. It depends on how big you want your cookies to become. You can even use a teaspoon. Your instructions left out the 1/4 cup of semisweet chunks. I’ve just added it to the recipe. Thanks for the heads up! These photos and this recipe.. Both SPECTACULAR. Now these are some really decadent looking cookies, I am drooling right now! Thank you Adina! They are the best in my baking life. All of those melty chocolate chips are making me so hungry! Yum!! Thank you Bethany! They were so fudgy and chocolatey that I’m sure I’ll be baking these quite often. You’ve really created a compelling case for these cookies with the gooey, crave-worthy photos! Sounds/looks delicious. Thank you! It’s so easy to make too! Hope you have a chance to try the recipe.